Need parts for an Excavator? ConEquip can help by finding used construction equipment parts from the most dependable manufacturers in the world. 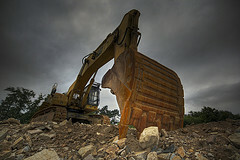 We also offer a full line of aftermarket new excavator parts, remanufactured parts, and new parts for your equipment. ConEquip offers parts for virtually every excavator brand available including Cat, Case, Kobelco, Komatsu, Deere, and Bobcat. Whether you need a bucket, a track, a linkage, or a final drive for your excavator, ConEquip is your source for your parts. We understand that your uptime is incredibly important and our parts specialist will work hard to get you back up and running quickly. An excavator parts specialist is waiting to help you find what you're looking for!